NHS Direct, introduced in 1998, has provided 24/7 telephone-based healthcare advice and information to the public in England and Wales. National studies have suggested variation in the uptake of this service amongst the UK’s diverse population. This study provides the first exploration of the barriers and facilitators that impact upon the uptake of this service from the perspectives of both `users’ and `non- users’. Focus groups were held with NHS Direct `users’ (N = 2) from Bedfordshire alongside `non-users’ from Manchester (N = 3) and Mendip, Somerset (N = 4). Each focus group had between five to eight participants. A total of eighty one people aged between 21 and 94 years old (M: 58.90, SD: 22.70) took part in this research. Each focus group discussion lasted approximately 90 minutes and was audiotape-recorded with participants’ permission. The recordings were transcribed verbatim. A framework approach was used to analyse the transcripts. The findings from this research uncovered a range of barriers and facilitators that impact upon the uptake of NHS Direct. `Non-users’ were unaware of the range of services that NHS Direct provided. Furthermore, `non-users’ highlighted a preference for face-to face communication, identifying a lack of confidence in discussing healthcare over the telephone. This was particularly evident among older people with cognitive difficulties. The cost to telephone a `0845’ number from a mobile was also viewed to be a barrier to access NHS Direct, expressed more often by `non-users’ from deprived communities. NHS Direct `users’ identified that awareness, ease of use and convenience were facilitators which influenced their decision to use the service. An understanding of the barriers and facilitators which impact on the access and uptake of telephone-based healthcare is essential to move patients towards the self-care model. This research has highlighted the need for telephone-based healthcare services to increase public awareness; through the delivery of more targeted advertising to promote the service provision available. In 2012, NHS Direct was replaced with the new non-emergency `111’ telephone-based healthcare service. It was first introduced in 2010, followed by a national rollout in 2013. The aim was to provide a more integrated non-emergency service to provide a gateway for all non-urgent healthcare needs . Although the introduction of `111’ has marked the end of NHS Direct , it has highlighted the increased role that telephone-based healthcare has within the NHS structure. Therefore, to understand patterns of NHS Direct uptake have provided an opportunity to learn valuable lessons about access and uptake of telephone healthcare based services. This knowledge can be applied to the `111’ telephone-based healthcare service, as well as services internationally, as countries worldwide adopt similar models of remote healthcare delivery -. NHS Direct provided 24 hour/7 day a week nurse led telephone-based healthcare advice and information to the public in England and Wales , (see Additional file 1). This service, introduced in 1998, marked a strategic shift towards the self-care movement  which encouraged the population to take an increased responsibility for their own health ,,. Evidence suggests that self-care is linked to improved health outcomes, improved quality of life, increased empowerment and patient satisfaction - and has been viewed as beneficial in reducing hospital admissions . Consequently, self-care is now being viewed as an inextricable part of the individual care pathway, from maintaining a healthy lifestyle to caring for minor, acute and long-term health conditions . NHS Direct has been at the leading edge of remote healthcare systems, directing healthcare into the 21st Century through the application of new technology solutions in primary care . By 2011, NHS Direct received 8 million calls per year with reported high levels of satisfaction . Whilst evidence suggests that there is an increasing shift towards self-care , with over 90% of people cited as being interested in taking more ownership of their health , the pattern is not uniform across all sections of society. For example, self-care uptake (and NHS Direct usage) has previously been reported to be substantially lower in those who are older (85+) , among the less affluent and deprived , and minority ethnic groups . Uptake of telephone-based healthcare services has been explained by the technical performance and functional reliability of technology , concerns of personal privacy and security ,, money, perceived confidence to engage with health technology ,, and severity of health symptom(s) . Perceived confidence to engage with health technology and severity of symptoms suggests that if an individual has low confidence to use health technology and has high perceived severity of illness, they are more likely to prefer face-to-face contact with a healthcare professional  and less likely to see the benefits in self-care . Factors enabling self-care include awareness of the services, and service recommendation and signposting by healthcare professionals . There is a dearth of evidence exploring explanations for usage and non-usage of NHS Direct. As the provision of healthcare moves away from face-to-face contact between patient and practitioner there is a pressing need to understand the reasons for usage and non-usage of telephone-based healthcare services to ensure that all sections of society are able to maximise opportunities for self-care. To examine the usage of NHS Direct this research makes a small, but valuable contribution, to help understand the barriers and facilitators to usage of telephone-based healthcare services. Nine focus groups were conducted between October 2011 and January 2012. A trained researcher (EC) facilitated the focus groups with the support of a research assistant, both of whom had no direct connection with NHS Direct that ensured the focus groups were unbiased. Focus group methodology was used to generate data as it involves a group interaction which can help participants to explore and clarify their views in ways that may be less accessible in a one to one interview ,. This methodology has been a commonly applied approach in health services research to identify views and attitudes towards health services -. Ethical approval was granted by the University of Bedfordshire ethics committee in March 2010 and the NHS Ethics Committee in April 2010 (REF: 11/H0301/8). All participants who took part in this study provided their written informed consent. Participants’ anonymity and confidentiality was ensured throughout. Table 1 presents the demographic composition of all focus groups and shows that each focus group comprised of between five and twelve participants (a total of 81 participants: 62 females and 19 males). Participants’ ages ranged between 21 and 94 years with the majority White British. A purposive stratified sampling strategy  was used to recruit in three geographical areas in England to ascertain diversity of opinion. Participants recruited from Sure Start centres in Mid-Bedfordshire. Sure Start centres are open to parents, carers and children providing early learning and full day care for pre-school children. Participants recruited from a range of Sure Start centres in Mid-Bedfordshire. Sure Start centres are open to all parents, carers and children providing early learning and full day care for pre-school children. Focus groups were held as part of an existing community group which provides retired adults mainly older (65+) a range of social activities and events. Older residents living in larger isolated rural community. Middle income families living in moderate suburban semis in a rural area. Deprived ward resided by families in low rise social housing with high levels of benefit need. Participants recruited from a range of community organisations which provide residents with their social, recreational and sporting needs. Deprived ward characterised by low income workers in urban terraces. Participants were recruited from a range of community organisations which provide residents with their social, recreational and sporting needs. Deprived ward characterised by low income workers in urban terraces and culturally diverse areas. Participants were recruited from a drop in community centre which provides residents a range of activities focusing on improving health and wellbeing. NHS Direct `users’ were purposefully chosen as mothers with young children (<5 years). Research suggests that this population group accounted for over 20% of all calls made , and represents the highest `users’ of NHS Direct . NHS Direct `users’ were recruited through two Children’s Activity Centres in Mid-Bedfordshire, as these sites were based in high geographical usage areas . Prospective participants were approached by the lead researcher (EC) and invited to take part. If they were interested they were then screened to ensure that they met the inclusion criteria. The inclusion criteria outlined that prospective participants were a mother of a child (<5 years) and had used NHS Direct at least once in the previous year for either themselves or their child. A total of two focus groups were held within this sample group before saturation was achieved . Participants (N = 17) were aged between 21 and 54 (M = 32.59; SD = 8.4), the majority classified themselves as White British (N = 16), with one participant who identified herself as Mixed White and Black Caribbean (Table 1). Two Local Authorities were chosen, one urban and one rural with mortality used as a proxy to identify need. This approach allowed for the identification of geographical differences of life expectancy between regions, districts, wards and output areas ,. Though the usage of expected life expectancy birth data, Local Authorities were chosen as (1) lowest life expectancy urban local authority area defined as urban 1 (predominantly major urban), and (2) the lowest life expectancy rural local authority area defined as urban 6 (predominantly rural 50/80) . Manchester was the chosen urban local authority which has the lowest life expectancy from birth which currently stands at 72.5 (CI: 72.1-72.8). Mendip, located in the South West of England was the rural local authority chosen with the lowest life expectancy from birth which stands at 77.5 (CI: 76.8-78.2) . Both geographical areas suffer from higher than average levels of deprivation. Manchester is ranked the fourth most deprived local authority in England , whilst Mendip is shown to have high levels of unemployment with pockets of deprivation throughout . A stratified `stratum’ sampling approach was then used on the basis of low geographical usage at ward level which was carried out and mapped NHS Direct call data and compared this to the concentration of calls by population through the use of geographical information system software ArcGIS  (Figures 1 and 2). The lowest usage wards were then explored using population segmentation (Mosaic) which provided detailed information that defined the population subgroups by a mix of demographic, cultural, behavioural, psychosocial, geographic factors  (Table 1). In relation to demography they should meet the characteristics of `non-users’ of NHS Direct depending on the ward chosen. 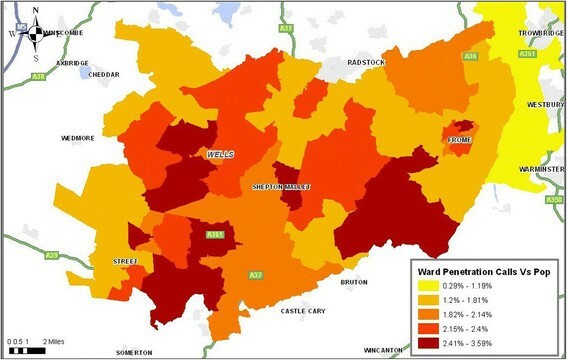 Penetration of calls to Mendip at ward area. Penetration of calls to Manchester at ward area. A total of four focus groups were carried out in Mendip in the wards Moor, Mells, Creech and Beckington & Rode. The Mendip sample were screened for age and were required to be ≤50 years as this population sub-group represent the lowest users of NHS Direct ,,. This sample (N = 41) were predominantly White British females with ages ranging from 50-94 (M = 79.93, SD = 10.08) (Table 1). A further three focus groups were organised with `non-users’ in Manchester in the wards Gorton North, Longsight and Baguely. The Manchester sample (N = 24) were also screened for representation of the geographical area and aimed to capture cultural diversity (Longsight) deprivation (Gorton North, Longsight and Baguely) and variation in gender within the residing wards (Table 1). All community centres and day centres in the ward areas were visited by the lead researcher (EC) in person. The centre manager was provided with a recruitment poster, a lay overview of the study, alongside a participant information sheet which detailed the study and outlined the inclusion/exclusion criteria. This information was then disseminated to prospective participants and those who were interested were asked to provide their name and availability to the centre manager. The focus groups were held in community or day centres. In Mendip some of the focus groups were held as part of an existing group; for Manchester, the focus groups were not part of an existing group. However, all participants were familiar with each other which allowed them to feel at ease within a familiar setting. Before the focus group took place, all participants were screened by a researcher (EC) to ensure that they met the inclusion criteria i.e. they reside in the ward defined and have not used NHS Direct service for either themselves or another person. Each focus group session lasted approximately 90 minutes and was audiotape-recorded with participants’ permission. Participants were asked questions surrounding their awareness of NHS Direct, why they have or have not used the service, the advantages and disadvantages around using this service, structural and perceived barriers relating to positive and negative attitudes. Questions also centred on the usefulness of the service and ease of use, alongside their attitudes towards communicating with healthcare professionals via the telephone. At the end of each focus group, the researcher gave the participants an opportunity to comment on the data and on the key themes that had emerged from the discussion to check and confirm accuracy. No factual errors were found in the data and there were no requests for amendments or amplifications. Data collection stopped once saturation had been reached. Focus groups were audiotape-recorded and transcribed verbatim using pseudonyms by a member of the research team (EC). The framework approach  was then used to thematically analyse the data which provides a generative analytical procedure that uses distinct connected stages of coding allowing for cases to be compared . The analysis closely followed the five distinct stages of analysis; (1) familiarisation, whereby the researchers independently reviewed a sample of the transcripts; (2) identify a thematic framework, whereby two researchers (EC & NA) independently identified and organised key themes after coding the first few transcripts and cross checked. All major themes achieved consensus. The next stage (3) indexing, whereby the lead researcher (EC) independently applied the themes to the text. This was followed by stage (4), charting, where the data was managed and summarised using Excel whereby the summaries for each code were transferred into cells with assigned page numbers to track the narrative. The final stage (5), mapping and interpretation, occurred through exploration of the relationships and patterns within the data , and was completed after research team discussions. Five themes emerged throughout the analysis of the transcripts which related to awareness of the service, costs to the individual, ease of use, time/speed, and acceptability of non-face-to-face healthcare. Similarities and differences between `users’ and `non-users’ are identified for these themes where relevant (Table 2). Overall, NHS Direct users had a good awareness and understanding of the service. They were aware of all individual services on offer including the core triage provision, health information and medicine advice services. Many participants were also aware of the internet based services, including the health encyclopedia and the Self-Assessment Tool software, which many had used to receive a call back relating to symptoms either for themselves or their children. There was a variety of ways in which the participants had heard about NHS Direct. Many `users’ were directed to NHS Direct through their GP answer phone machine when they had phoned their surgery out of hours. However others were made aware of NHS Direct through their midwives when they had children. One participant saw the service advertised through yellow pages (a telephone directory), and also recalled seeing through local level advertising. In fact, a number of participants recalled a small credit card leaflet which had the telephone number on which participants could keep in their wallet. Conversely, in Manchester and Mendip there was a distinct lack of awareness was evident across all `non-user’ focus groups. Many of the participants had never heard about NHS Direct or the services that they provide. There were also uncertainties and misunderstandings of what services NHS Direct offered. For example, a number of participants thought that NHS Direct was a walk in clinic or provided an out of hours GP service. NHS Direct operated from a `0845’ number, which is a cost of a local rate from a landline. However, the cost is substantially higher from a mobile phone when not covered by an inclusive minutes plan . It is important to note that the researcher did not explain the cost to identify awareness of this, so anything relating to cost was brought up by the participants. Amongst the NHS Direct `users’ only one participant mentioned the cost of the phone call, whereby she spoke of her friend who was a single parent and could not access the service because of the expense incurred on the use of her mobile phone. Many of the `users’, use landlines to phone NHS Direct and were not aware of the cost implications to use a mobile phone. However, when they realised this all participants said that this would not affect future usage. However, `non-users’ in the focus groups in Manchester were much more aware of the cost incurred when using NHS Direct, whereby this service was viewed as very expensive. Many of the participants did not have landline phones so had to rely on using mobile phones to access the service. Participants felt that if something was seriously wrong they would just phone `999’ (emergency phone line in the UK) as this was a free number. The `non-users’ felt that if NHS Direct was free to access they would be more likely to use the service. Although, there were discussions of concern that surrounded how the money to cover the cost of the call would be subsidised and if this would subsequently lead to further cuts to local NHS health services. In contrast, the majority of the Mendip participants did not mention the cost of the telephone call throughout any of the focus group session. However, many did not use mobile phones and they all had access to a landline phone. At the end of the focus group the researcher explained that the calls are charged at a national rate and the cost may be substantially higher when using a mobile phone, but no participants advised that this would impact on their decision to use this service. All of the participants who had used NHS Direct found the service easy to use with many participants highlighting that it was easier to use than using conventional out of hour’s services e.g. GP co-operatives, Accident and Emergency, pharmacies. The main benefit disclosed was that you would not have to leave the house. However, for participants in the Manchester sample there was a mixed response. Whilst there were a few participants who felt that they would find NHS Direct easy to use, the majority felt that to use the telephone would involve many deterring issues. For example, there was a perception through prior experiences of use of telephone services that there were too many options which would make it more complicated to use. Another perceived barrier which would impact on the ease of use, was the belief of being passed from person to person, which was felt as frustrating and would increase anxiety, especially when the call relates to an individual’s health. There were a number of issues about speaking to somebody on the telephone as opposed to face-to-face. For example, one non-user was dyslexic and stated that he finds it easier to speak to his GP face-to-face due to the difficulties to express himself. Another issue related to language barriers. For example, not speaking English fluently was felt to impact negatively upon ease of use and confidence of using the service. The researcher did explain that NHS Direct did operate a translation service `language line’. However, none of the participants were aware that this service existed. Particularly for the Mendip sample, there were a range of barriers that would impact on ease of use. The biggest concern related to hearing, where many of the participants relied on using their hearing aids that made it difficult to communicate over the telephone. They felt that this would prove difficult when they have to explain symptoms when they could not hear what was being asked of them. Hearing was also a concern in relation to whom they would speak to. Participants from Mendip highlighted that they found foreign accents difficult to understand on the phone and often had to ask them to repeat themselves which they felt would prove difficult. Participants from Mendip also discussed technical issues. For example, one participant from Creech, stated that there are a lot of technical issues related to the use of the telephone such as being cut off. Other physiological barriers related to memory, which was also suggested to impact on the ease of use. For NHS Direct `users’, speed to obtain healthcare advice was the key advantage of the service, whereby the majority of participants viewed this service to provide `instant advice and reassurance’, and valued being able to speak to a trained nurse or healthcare professional quickly. However, some NHS Direct `users’ did not agree with this perspective, and had some negative experiences that related to the amount of time it took to be called back by a nurse, and the time of day that they were called back e.g. being called during the middle of the night. For some participants, to wait a long time was perceived as reassurance, as it reflected that they were considered to be a low priority in terms of concern for their health condition. NHS Direct `non-users’ from Manchester and Mendip felt that waiting was a core barrier to use the service, whereby there was a distinct preference for instant face-to-face healthcare. Many of the participants shared concerns about the wait to be called back and did not like the thought of to wait on the telephone for long periods. There was a perception that NHS Direct was seen as a side step of out-of-hours care so was seen as `wasting time’. However in contrast, two `non-users’, from Longsight, Manchester, felt that NHS Direct could save time to provide instant reassurance instead of going straight to an Accident and Emergency Department in a hospital. NHS Direct `users’ felt the service gave them reassurance and enabled them to make the decision whether to escalate their health concerns or not. They also felt it gave them the reassurance that they had sought advice from a trained healthcare professional. None of the NHS Direct `users’ were concerned that it was not a face-to-face service. In fact, many `users’ highlighted that they preferred the lack of face-to-face contact, and viewed the service as both personable and professional which provided them with the level of reassurance they needed. Conversely, `non-users’ from both Manchester and Mendip outlined an overarching preference for face-to-face healthcare. `Non-users’ felt that face-to-face healthcare offered more reassurance than speaking to somebody on the telephone. They also felt that if it was face-to-face they would be able to express themselves better and would feel more at ease to ask questions. There were strong positive attitudes towards face-to-face communication. It was felt important by `non-users’ that an individual could express themselves through body language. It was also more personable when speaking to someone face-to-face. Participants agreed that personal face-to-face interaction with a healthcare professional is an integral aspect when seeking healthcare advice, which presented a barrier to using telephone-based health services such as NHS Direct. This study has explored the barriers and facilitators to use NHS Direct, a hitherto under researched area. This research has uncovered explanations for usage and non-usage of NHS Direct. The core themes which emerged from the focus group discussions were related to awareness, costs to the individual, time/speed of the service and the acceptability of non-face-to-face communication. This research highlights that participants’ views on self-care varies by age, ethnicity and socio-demographic factors . NHS Direct `users’ held a good awareness of all services that NHS Direct provide. However, there was a distinct lack of awareness among the `non-users’. Whilst many individuals from both Mendip and Manchester had heard of NHS Direct through media and out-of-hours signposting, there was a clear misunderstanding, with many who believed that it was a walk in service that operates out-of-hours. This supports research that has suggested awareness of this service is low , which indicates that the impact of previous advertising campaigns has been largely unsuccessful in reaching all sections of the population. It is clear that awareness is a core mechanism which impacts on health service uptake  and, therefore, these findings reinforce the importance to provide clear information through tailored promotional campaigns to ensure all sections of the population are informed. NHS Direct `users’ suggested that they did not view the cost to use NHS Direct was a barrier, with many not aware of the cost implications to use the service. Conversely, `non-users’ from Manchester felt the service was extremely costly, especially as many relied on pay as you go mobile phones. This view was not reported by `non-users’ from Mendip, which suggests that the cost of the service appears to be an access barrier for those in deprived communities who are unable to afford to use the service. As such, it appears that NHS Direct and other telephone-based services should be aware of the impact that cost may have on uptake by individuals from more deprived communities. Nonetheless, as the new non-emergency `111’ NHS phone line is rolled out nationally as a free service it will become even more important to communicate to the public that service has no cost, so this should not be a barrier to access. A particular advantage of NHS Direct for `users’ was that the service was accessible and easy to use. However, the predominantly older Mendip sample felt that there would be issues that relate to hearing and memory that would impact on discussing healthcare information via the telephone. Older peoples’ access to modern technology has been extensively debated with research that suggests that, not only physiological changes associated with ageing such as decrements of sight, hearing, dexterity, motor functioning, co-orientation and cognitive processing can impact on newer models of healthcare -, but also a wide range of psycho-social factors. For example, uptake has been strongly dependent on income, education, experiences, and attitudes , with confidence that relates to ease of use, shown to influence significantly older people’s adoption and use of new technology -. There is an assumption that there should be a `universal’ take-up of technology ,. Whilst this assumption is challenged , access to technology driven healthcare can be increased through two main ways: (1) ensure that the service is easy to use, and (2) through the provision of tailored information to enhance awareness of such services within the UK’s diverse population. A key advantage for `users’ was that NHS Direct was a quick way to access advice and health information. However, `non-users’ discussed the preference for `instant’ face-to-face reassurance with NHS Direct viewed as a diversion. On the other hand, `non-users’ suggested a clear preference for more traditional face-to-face health services both in and out-of-hours. This appears to support previous literature that has identified that older people ,, ethnic minority groups , alongside those from socially deprived communities , prefer and have more confidence with face-to-face healthcare communication. This could also relate to the fact that ethnic minority groups , older people and those who are from more deprived backgrounds prefer doctor-centred healthcare , and prefer to take a passive role in their health. Whilst this research provided a wide overview of the facilitators and barriers of a telephone-based healthcare service there were some limitations that are noteworthy. Firstly, the NHS Direct `users’ focus groups only focused on one high `user’ group i.e. females with young children. This was also reflected by an imbalance between the numbers of participants in the `user’ versus `non-user’ focus groups (17 v 54). This imbalance is an outcome of the breadth of issues uncovered in the `non-user’ focus groups alongside the inclusion of `user’ focus groups which captured a diversity of opinion through a wide range of geographical and socio-cultural factors. Nonetheless, focus groups from other `user’ groups, such as younger adults aged 20-34, may have provided further insight into the barriers and facilitators of such health services. Secondly, whilst there was an attempt to capture ethnic diversity, this was only evident in one focus group. As such, future research should aim to examine the barriers and facilitators of such services accounting for a wider variation of ethnicity. In particular, studies should focus on other `non-users’ (e.g. Eastern European, Chinese and Black African ) to determine the range of cultural factors that impact on the engagement of telephone-based healthcare. Finally, some of the focus groups were existing groups, in particular the Mendip sample. There were clear challenges to recruit older participants, and whilst this may have created some bias, it showed to be a useful way to reach a `hard to reach’ community sample. This research uncovered a wide range of factors which impact on the uptake of NHS Direct. Acceptability of non-face-to-face healthcare was a key driver to use NHS Direct. Whilst `users’ found the service both convenient and easy to use, `non-users’ emphasised a clear preference for face-to-face healthcare. This was supported by a lack of confidence in discussing healthcare over the telephone, particularly in older groups who had cognitive and sensory difficulties. Awareness and cost also impacted on usage, whereby `users’ showed a higher level of knowledge and awareness of the service. Conversely, `non-users’ had a low awareness and the cost of phoning a premium `0845’ number was also viewed as a barrier, particularly from those in deprived communities who rely on a mobile phone. It is apparent that although some barriers are the same for both groups of `non-users’ in Mendip and Manchester, there are some differences. This suggests that a one size fits all approach cannot be adopted. Instead socio-demographic factors need to be taken into account to identify the barriers to enable the service to become more accessible to all communities. Therefore, if other similar services such as the new `111’ service are to become a more widely used model of remote healthcare then it is essential that the barriers and facilitators to access telephone-based services are addressed. Increased access will subsequently improve the patient experience and the urgent care pathway. In turn this will reduce the need of unnecessary visits to already overstretched healthcare services. A recognition of the factors that do and do not make people access and use services such as NHS Direct, will help to mobilise patients towards the self-care model and support them in to take responsibility for their own care ,,. EC, GR, SL, AG, AC conceived and designed the study. EC conducted the interviews and coded them with NA. All authors contributed to interpretation and prioritisation of findings. EC drafted the paper with NA and AC. All authors contributed to writing the paper. GR is the guarantor. All authors read and approved the final manuscript.